Here are Jen and Dan on their first ride at Cheryl's. She'd ridden him once before when he was at home. They did GREAT! I was so impressed by how she rode him. 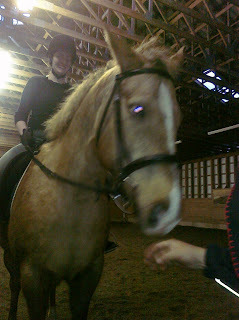 He's only been ridden maybe five times in the last year and a half, if that (I know, I'm very slack - I can't find time! 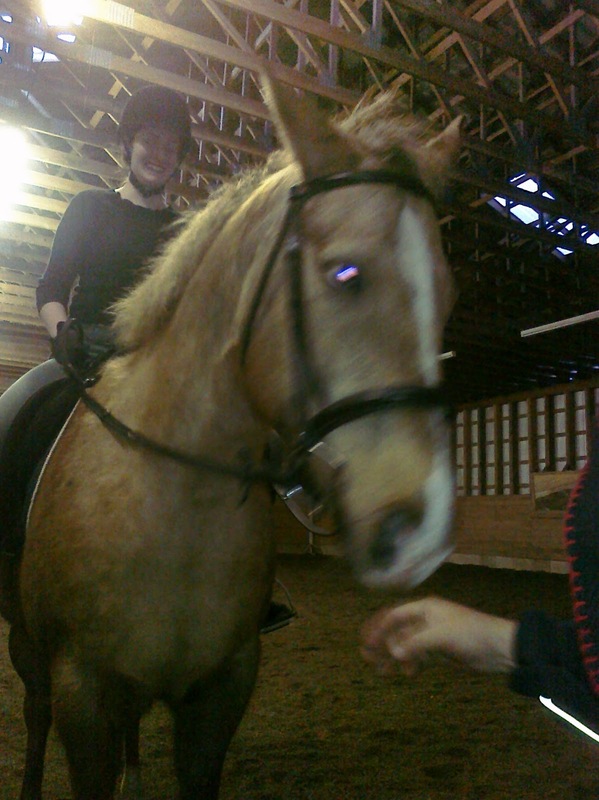 ), and I expected he'd be flighty and silly for his first few rides. We longed him together, me starting, then Jen took over. 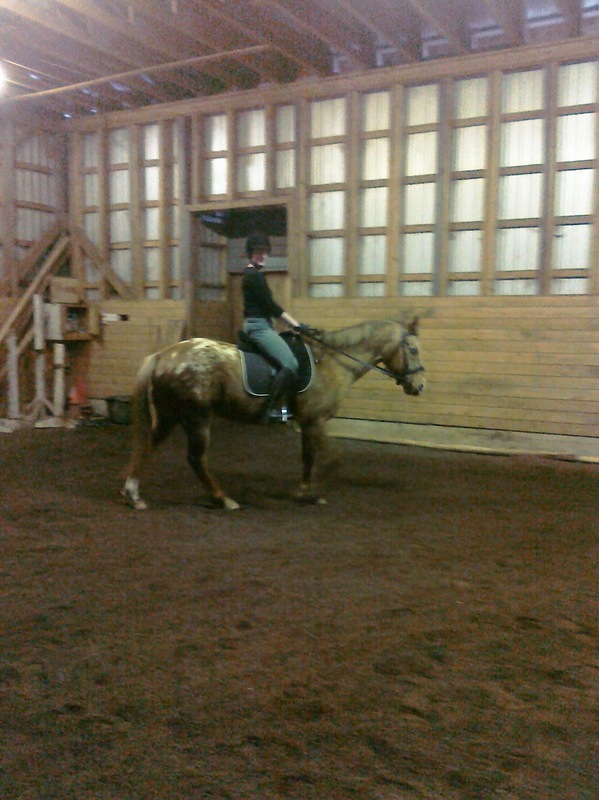 Then I longed her on him the other way and then she rode on her own. Dan seemed to really connect with her. Dan sticks his head up in the air, but she made great progress with it throughout her ride. You could see Dan progressively becoming more relaxed, having periods of going on the bit and by the end of the ride he was actually stretching down for her when she gave him a break. Yeah Jen and Dan! The thing that really impressed me about both of them was that Dan quickly began focusing on her - you could see him concentrating, licking his lips a lot and keeping an ear turned toward her. He was responsive to her aids and they did w, t, c both ways and also some turn on the forehand, turn on the haunches (his first ever - not perfect but not bad), figure eights and flexing in and out. Jen rode him very softly and asked him for gentle bends to get him to relax and take the bit and you could see it working. I was impressed with her riding - she was quiet, had a good influence on Dan and knew what she was doing in riding a horse that had been off for quite a while. Dan can be spooky when he isn't being worked regularly and there was snow coming off the roof yesterday, so I even wondered if we'd just have to longe yesterday and wait for another day to ride, but he was fine. Obviously he'll need to get back in shape, but this was a very good start. She plans to ride him once a week or so, when ever she can get to the barn, so I know that with her doing that I'll be motivated to help. I'll longe and do ground work between. Doug and I rode Savanah and Rogo earlier in the day, but they were both more interested in getting outside to play then in having a lesson. Can't say I blame them. We turned them out after riding and they were exuberant and silly. Good horses! Dan has such a good head on his shoulders, and he can thank Mummy Carol and Daddy Doug for that! Can't wait to see you again on Sunday Dan! I'm so glad that Dan and Jenn clicked, every horse should have his own person to fuss over him. I'm sure when he gets back in shape he'll be awesome. He got a good start today. I love the "bring on the pampering" paragraph! That Dan! How lucky is he to have found Jen to spoil him up?! I like this post and look forward to more about their rides together.